The Business Psychology major is designed to train students to apply psychological principles to the workplace and to organizational challenges and opportunities therein. Lower-division courses for the major should be completed by the end of the sophomore year. These requirements will guarantee an adequate background for the topics of the upper division psychology courses. *Only one of CHEM 4 or 11 can be taken for credit. **Only one of BILD 12, COGS 17 or PSYC 2 may be counted towards this requirement. *By petition department will accept COGS 14A (SOCI 60 is NOT accepted). **Students who are interested in fields that may require calculus are advised to take MATH 20A and MATH 20B towards their formal skills requirement. 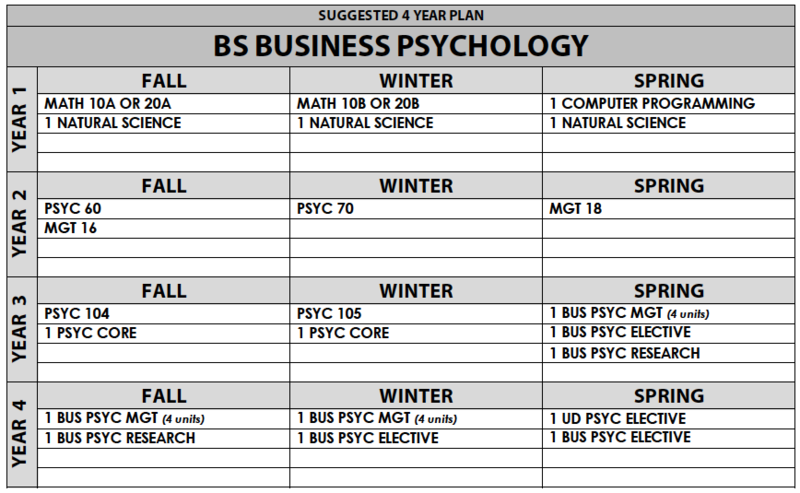 * Students who plan to pursue research careers in Psychology or related fields will find these courses critical to their success. 1 Statistics Course (choose one of the following) - Statistics must be taken for a letter grade. 2 Business Fundamentals Courses - Business Fundamentals must be taken for a letter grade. *Successful completion of PSYC 194ABC fully satisfies the research requirement. **If the research experience requirement is fully satisfied by PSYC 199/MGT 199, one of these must culminate in a research paper approved by the faculty advisor and submitted to the Psychology Student Affairs Office no later than 3:00 PM Thursday of the final exam week of the student's graduating quarter. Failure to submit your BS research paper by the deadline delays your official graduation term to the following quarter. *Students are not required to choose a concentration to earn the degree, and may choose any 12 units of the courses listed; concentrations are not listed on a student's degree audit or diploma. **MGT 129: ONLY the topics of interpersonal Communication at Work (all concentrations) and Developing an Entrepreneurial Workforce (STEM concentration only) will be accepted toward the major. *Students must choose at least one of these courses. *By petition department will accept one PSYC 195 and/or one AIP 197. Classes towards the major must be taken for a letter grade. The only exceptions are: natural science, computer programming, formal skills, PSYC 195 (up to 1 by petition), AIP 197 (up to 1 by petition), PSYC 99, PSYC 199. Graduate courses (2XX) are not generally accepted for credit towards the major, but petitions for exceptions will be considered. A maximum of three upper-division courses towards the major may be taken outside of UC San Diego (see Petitions). A grade-point average of at least 2.0 in the upper-division major courses is required for graduation.